High school athletics, maybe more so than at any level, is a very cyclical process. Rarely are schools able to sustain extended runs at the top as waves of talent run in and out every four years. 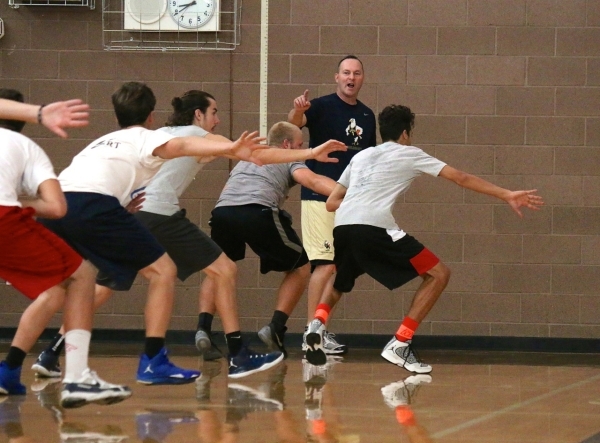 Boulder City High School finds itself in that cycle, six years removed from a state championship, yet to find that kind of statewide prominence again. 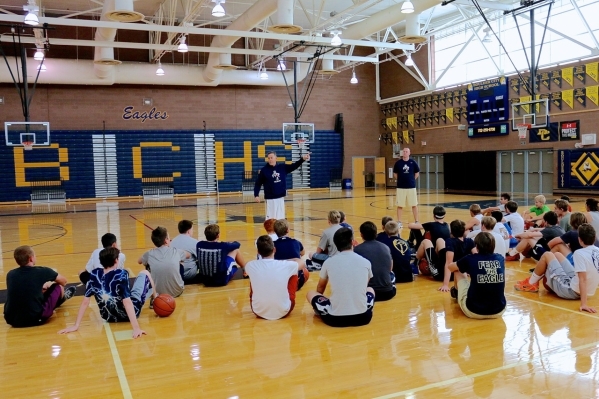 But if you ask boys basketball coach John Balistere, there is a plan, a plan to bring a high school with the second-most basketball state championships in Nevada back to where it once reigned. The 1984 state champion — who by day is the director of basketball operations for MGM Resorts International — is on his way to doing just that, compiling a school-best 58-43 record over his four years at the helm. The Eagles return five lettermen from last year’s 10-15 team, including three starters. The core of this year’s team has been playing together since eighth grade, according to forward Zac Murphy, who said the cohesiveness of the team will lead to an exciting season. Boulder City will no doubt have to play as a solid unit, as it faces one of the tougher schedules in the Las Vegas Valley this year. Seven of the Eagles’ first eight games are on the road this year, including two of the first three against teams who made the postseason last year. BCHS opens up Saturday at Valley, which finished 26-5 a year ago. The Vikings were a two-point loss away from qualifying for the state tournament last season. One thing the Eagles won’t be is the most intimidating team when they walk into opposing gyms this year, as they lack size in the frontcourt. Balistere said what the team lacks in size it makes up for in experience, and the team plays hard. “I think we’ll surprise some people this year,” he said. Not having enough size down low usually leads to teams playing zone defense, which allows for the five members of the team to be closer to the paint to help out. However, the basketball disciple of longtime Duke University coach Mike Krzyzewski — who’s known in the basketball world for playing less-than-little zone defense — said the Eagles will play man-to-man defense about 85 percent of the time. Desert Pines will be the Eagles’ toughest competition this year. The Jaguars beat the Eagles twice last year by an average margin of 27.5 points per game. Desert Pines has three players on its roster who have either committed or are being recruited by Division I college programs, including 6-foot 7-inch junior forward Greg Floyd Jr., who holds offers from Arizona, Miami, UNLV and West Virginia, to name a few. Floyd Jr. has been acknowledged by most recruiting sites as the top prospect in Southern Nevada.